ooohhh... I'm first. This picture brought such a smile to my face. Very cute. So...what's the line for? Oh, that's hysterical...this made my morning, too. Eh you, you are not in starting blocks !!! I love those sheep that have the white wool and black faces. There is something so ... hmm... nostalgic about them. I find them prettier to look at. Are they about to start a race?! Mijo and I were seeing the same thing in this pic! Very cute. I am putting ALL my money on the wooly one with the dark face...! 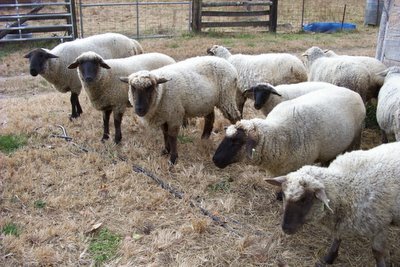 The sheep in the top left of the photo is our purebred Suffolk ram, Leopold. He is the only one with a long tail (you can see part of it). This is the first picture of him I've posted. Next to Leopold is Teddy, also briefly known as Uncle Teddy. I think that's Zelda next to him, but I'm not absolutely positive. The tiny lamb behind her is Beattie, who was the unexpected star of my very first blog post. That 'line' is actually the black hose we use to fill water troughs. For some reason the sheep (who usually come out of the barn single file and then start walking en masse toward one of the fields) just kept filing out and lining up side by side. When I saw the hose, I couldn't resist taking a picture. It really did look like they were getting ready for a race. Welcome to the farm! Thanks for taking the time to write. I've always had a soft spot for the black faced sheep, too. 'Nostalgic' is a good word to describe them. I love your picture of the sheep. I will have to post my sheep pictures. What kind of sheep are they?